The ST series offers a best-in-class lumen output in a minimalist architectural design, perfect for a wide variety of commercial and consumer lighting applications. The RCA ST series lends a modern touch to any new construction or retrofit project. 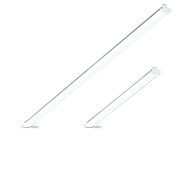 RCA Linear's smooth, frosted lens will provide even illumination that reduces both eyestrain and energy consumption. The ST series is installer-friendly with a lightweight aluminum hinged bottom, knockouts for easy wire access and a full length wire channel for end-to-end wiring. ST series offers fully dimmable 4' and 8' 5000K models, at over 120 Lumens per Watt. Optimized for efficiency, the ST series offers over 120 Lumens per Watt. At only 27 watts and 56 watts on our 4' and 8' models, they brighten an area and save electricity. Using a LG-Innotek driver, the ST delivers low-energy and low-heat output to maximize the life of LEDs. Extruded aluminum housing provides strength and doubles as a heat sink. A full length wire channel allows easy end-to-end wiring. Our UL Listed junction box design leaves plenty of room for connections. A low profile design is perfect for "close to ceiling" applications. 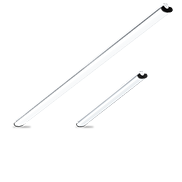 Using reflective and refractive materials to control the light off our angled LED strips allows 120� of evenly distributed lighting. The impact-resistant frosted lens eliminates bright spots that typically cause glare and eye discomfort in direct lighting. 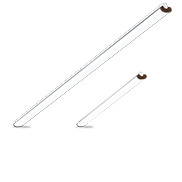 The ST series' completely sealed fixture prevents dust and debris build up inside the light. The smooth, frosted lens makes the exterior easy to wipe down. Standard replacement drivers are available for future needs, unlike most other lighting products.